A look at the best e-nails, electric dab rigs for concentrates that are becoming the new standard for regular dab and wax users. An e-nail is an electronic concentrate vaporizer. Similar to a traditional dab rig, most e-nails attach to a regular waterpipe or vape mod, whereas others function as standalone units. Much like dry herb vapes, e-nails can be broken down into desktop and portable models. Both types of e-nails utilize some type of electric heating element and power source to achieve optimal temperatures for vaporizing waxy concentrates. "They're a tastier, more efficient, easier to use and safer alternative to traditional oil rigs." If you’re looking for a more portable and discreet way to dab, check out our best dab pens and best wax atomizers. This page will be focusing on specifically e-nails, e-nail rigs or in other words: electronic dab rigs. Do you dab on the daily? Are looking for a way to dab with your favorite box mods? Say no more. The Kandypens Icon is portable and includes everything you need to dab. Now you can literally dab wherever you go. It even has illuminated LEDs that light up while you vape. The Kandypens Icon uses a standard 510 connection and supports TC and Wattage modes. It comes with three nails (quartz, ceramic and titanium) so you can decide which one you like best. The Icon also includes a magnetic carb cap and loading tool. Mod and batteries not included. The Boost by Dr. Dabber was one of the first of its kind. It’s a completely portable, all-in-one unit that is designed for vaping waxy concentrates anywhere you go. The Boost e-rig draws power from an 18650 rechargeable 2500 mAh battery in order to heat up the nail used for dabbing. You receive everything in a nice padded carrying case that includes everything you need to get started, except for the concentrates, of course. Dr. Dabber provides three types of domeless nails so you can experience the subtle differences between titanium, ceramic and quartz. Dr. Dabber is already well known for its wax pens and accessories that have been imitated by many, but their customer service is where they excel. 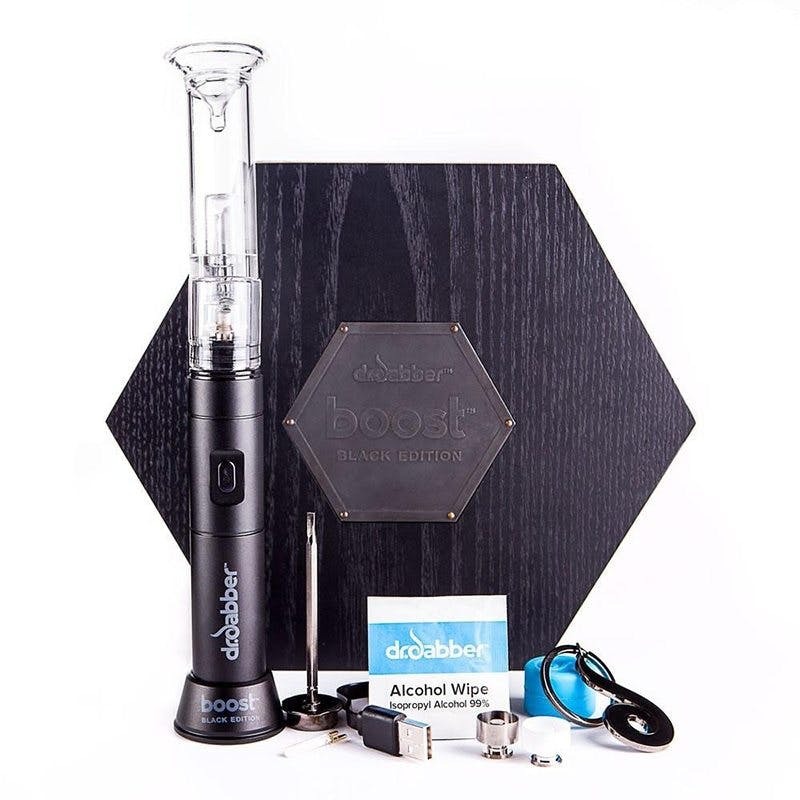 Dr. Dabber stands behind all of their products and offers a one-year warranty with customer support, which should make you more confident about spending your money. Dr. Dabber also makes a 510 version of this e-nail that attaches to your regular vape mod. The Everybody Does It e-nail comes contained a handy hard-shell case. 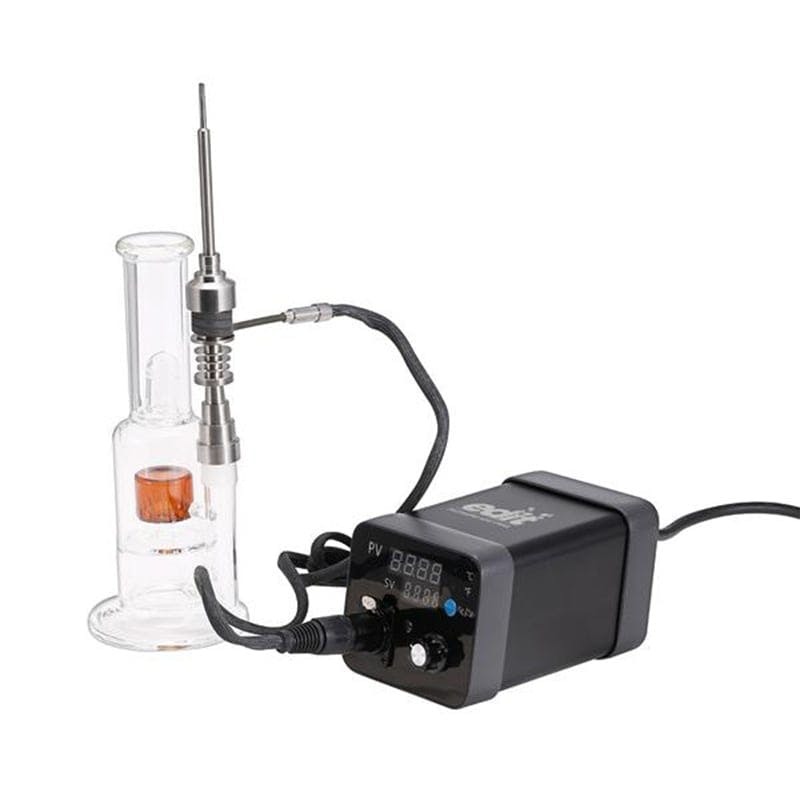 The kit includes a compact PID controller, remote, titanium nail, heating coil, carb cap, power cable and heating cable. Temperature controlled up to 1800 F. Unlike similar devices, this e-nail is affordable too. An included titanium nail has a universal fitting to accommodate the most popular bong sizes. That means you can still use all your favorite glass pieces with this setup. Have a dab anytime you’d like, on demand. The PID E-Nail is a great option for anyone who’s ditching the torch on a budget. The Hyer Big-E Rig looks like it’s from another planet, but it comes in peace. A cordless solution to e-dabbing, this e-nail makes a secure connection to your existing glass pieces. Utilizing a quartz nail and a ceramic heating element, it’s made for dialing in those low-temperature dabs. Powered by quad 18650s, the Hyer Big-E Rig puts out 48 watts of power and heats up to 750 degrees Fahrenheit. 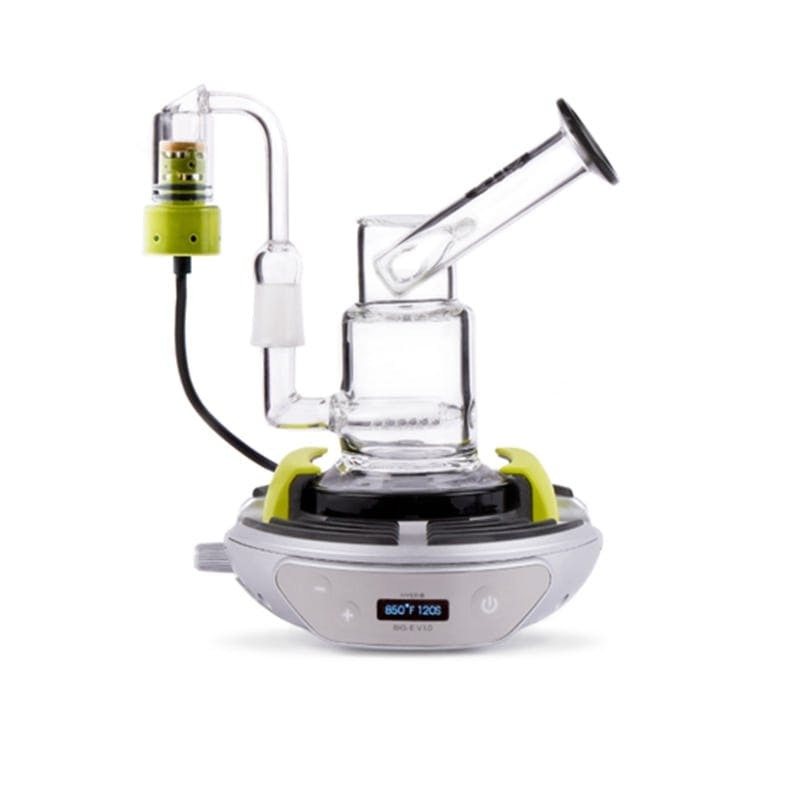 It has a user-friendly LCD interface, and an LED and vibrational indicator to let you know when it’s time to dab. It comes with a dab tool and storage compartment built into the design and there’s also a cleaning mode, so it’s very easy to maintain. Out of all the desktop e-nail manufacturers, we have found High Five Vapes to be among the most dependable overall. The e-nail world is filled with imitations and companies trying to cash in on this booming trend. High Five Vapes doesn’t just provide quality products, but also excellent customer service. All of High Five’s e-nails are manufactured by them and are reasonably priced compared to the competition. Based on the overwhelming customer feedback we’ve seen, we highly recommend going with this company if you are serious about purchasing a good e-rig. If you are already convinced that e-nails are the future of dabbing, but don’t even know where to begin, this is the perfect package for you. 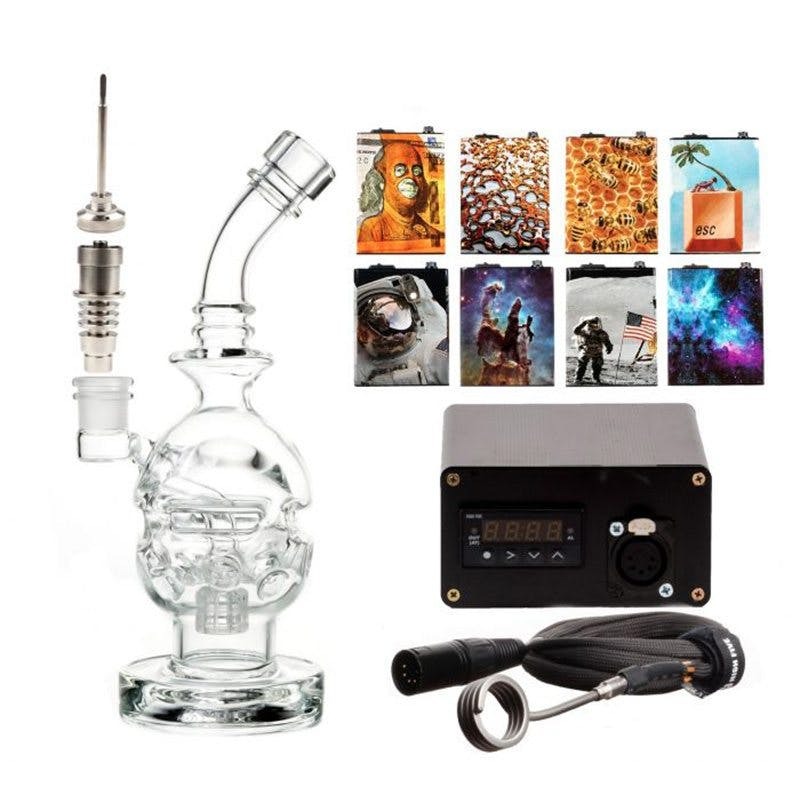 It includes literally everything you are going to need to get started including the temperature control box, a 6 foot long coil, 8 foot long power cord, and your choice of either a quartz e-banger, domeless nail or a titanium domeless nail. You also get a carb cap set and a glass piece with a 14mm female joint. High Five e-nails are available in a variety of awesome skins like Benjamin Danklin, Astronaut and Galaxy prints so you can customize it based on your style. Last but not least, all of HIgh Five’s products come with a 7-day return policy and the best customer service available. E-nail rigs, also called e-rigs, are quickly becoming the preferred daily driver for dabbing within the concentrate community. Until their arrival in the market, typical dab rigs required a torch to heat up the nail before it makes contact with the concentrates. Aside from obvious safety concerns, using a traditional dab rig required a certain level of expertise in order to achieve the perfect dab. Too much heat can actually combust your concentrates, whereas not enough heat won’t evenly vaporize everything, leaving you with a messy nail to clean. Electric dab nails solve this issue and provide some welcome relief from the scorching hits associated with butane torches. They may also reduce harm to the lungs. A typical desktop e-nail setup utilizes temperature-sensing technology paired with a heating element that wraps around the bottom of the nail. Once you dial in your preferred setting, it maintains that exact temperature until you turn the unit off, so it’s always ready for a dab whenever you are. With e-rigs, anybody can enjoy a flavorful and effective vape right off the bat, without much experience or a big learning curve. With a regular dab rig, a torch is used to heat the nail, which sometimes can instantaneously combust your concentrates, a process known as flash vaporization. If not done properly, you can waste a lot of dabs this way! Hence the reason the e-nail came to be so popular in the cannabis community, especially among serious concentrate enthusiasts. The biggest problem with using a blowtorch is that it’s hard to know the exact temperature of the nail at any given moment, so using a traditional rig is an art in itself. E-nails can be dialed in at lower temps so you actually get a richer terpene profile, highlighting the individual flavors and psychoactive effects of each strain. You really don’t need to be a dab veteran to operate one. Desktop e-nails come in various forms, but they all have the same essential elements. A box that functions as the brain of the entire operation, a cable with a heating element on one end, and an XLR cable on the other, and of course the main stars of the show: the nail and waterpipe. The temperature of the heating coil is constantly regulated by way of a PID controller, which is used in many other industrial applications for calculating temperature change. This technology allows the e-nail to maintain your preferred setting, similar to temperature control vaping with e-cig. Most e-rigs boxes come with an LED screen that will display your temperature in real-time. These boxes typically run on A/C power and plug into your wall, unlike the portable devices. Portable e-nails are small, simplified versions of these bigger desktop units. They have a lot in common since they both utilize some type of heating element, glass mouthpiece and a power source, but these rigs are ideal for traveling. Some portable e-nails are powered by either internal or rechargeable batteries like the Dr. Dabber Boost, or attach directly to the 510 connection on your vape mod, such as the Atmos Studio Rig or the Kandypens Icon. Don’t be intimidated by the LED lights and the wires. Using an electric dab rig is very simple! Plug your box into the wall and dial in your ideal temperature. If you are using a domed nail, make sure the dome is on first. Dab a small bit of concentrate onto the nail while inhaling from your pipe. If you are using a carb cap, place it on top of the nail while taking a puff. That’s it. Many domeless nail users prefer using a carb cap instead to cover the nail while taking a hit, because it increases both the overall flavor and vapor production. Most carb caps come attached to a dabber, so there’s one less piece to worry about versus using a domed nail. Note: Domed nails served their purpose with traditional oil rigs, but are being replaced by carb caps by more users of these electric dab setups each day. The most popular material used for e-nails is titanium because it is relatively inexpensive, durable and safe to inhale (as long as it is Grade 2 or better). The advantage of using Titanium nails, aside from the price, is that they can last a long time if properly taken care of. The downside is that they can sometimes add a metallic taste to your vapor. The flavor chasers of the e nail world have moved away from titanium and discovered that ceramic provides much better flavor despite being more expensive and fragile. Another con about ceramic is that it is harder to restore back to its original clean condition. Quartz nails are now becoming the preferred method of dabbing, especially among flavor chasers because quartz is much more durable than ceramic. The jury is still out on which one has better flavor; it may just come down to individual preference. They’re very close. It all might sound like a whole new world at first, but bangers and honey buckets serve the exact same purpose as a regular nail, they’re just different in terms of size and shape. Bangers and honey buckets protrude out of an arm that attaches to your heating element, keeping the heat further away from your face. They also allow for increased surface area to hold more dabs.